After a week of travel and back-to-back fascinating interviews of le donne di Piemonte (women of Piemonte), I was ready for a break to process all that I had learned. Spending my Saturday morning strolling through the Alba mercato and through the ancient city’s old town was just what I needed. But now it was time for lunch! I’m such a creature of habit. Fortunately, some are good habits, like never missing an opportunity to have lunch at La Cantinetta in Barolo. As I drove to the western side of the Langhe, the skies were darkening and curtains of rain fell in the distance. Monte Viso and its neighbors in the Cottian Alps had been so prominent below the azure blue skies two days ago, but now were hidden in the clouds. The autumn-like chill in the damp air made me feel as though I should be in search of tartufi bianci. But looking out over the barren, pruned vineyards, there was no mistaking the season. It was spring and the vines were merely waiting for the sun’s signal that it was safe for the swelling buds to break. The locals were a bit worried about the never-ending cold, damp weather. But there was still time for Mother Nature to help the vines along before flowering in the waning days of spring. When I walked into La Cantinetta, with its walls covered with shelves of wine in the front room and simple larger dining room to the back, I was disappointed not to find co-owner and manager Maurilio Chiappetto running about the restaurant. Everything was the same as it had been since we first ate there with 16 year-old Giuseppe Vaira nearly 14 years ago, except there was no Maurilio, dressed in an apron – usually a blue Deltetto one – bustling about. But I was assured he would be in the afternoon. Good. It wasn’t just the food I was after. I wanted to interview Maurilio and to finally have a chance to learn more about him, his brother and chef Paolo, their 89 year old “agnolotti-loving” father, Giovanni, and their fascinating traditional Piemontese restaurant they had been running since 1981, first in Alba then in Barolo since 1995. Somethings must change and since I was on my own at the restaurant for the first time, I opted for a small table in the front room, next to shelves of some of the most noble names in Piemontese wines. I also figured I had a better chance of catching Maurilio in the front near the cash register. La Cantinetta is one of those marvelous restaurants that has a menu, I think, but offers you whatever chef is cooking for the day. All you have to do is say “yes” or “no” to the courses as they come out. That day I was determined to keep the calorie count below 5,000 and only have the small plates of uber-traditional antipasti. I could write a 1,200 word column on antipasto (singular of antipasti – but let’s face it, when have you ever had just one antipasto?). I’m not doing that now. The word, derived from Latin and meaning “before the meal,” dates to the 1500’s, according to one dictionary source. For the most part, Americans equate antipasti with a plate of salumi, olives and the like. But the Piemontese concept of dishes “before the meal” in fact can be a meal! At La Cantinetta, it is more than a meal! Can’t believe I usually have Paolo’s antipasti (which is about five different plates, cold then hot) and primi piatti (usually two different different pastas and one risotto) and seconde (usually brasato, roasted lamb or chinghiale – wild boar). Of course, let’s not forget the incredibly delicious, crispy grissini that grace every table in Piemonte. Grissini are basically Piemontese bread sticks, but not like the skinny massed produced, pre-packaged kind. A glass of Dolcetto and grissini would probably have sufficed, but what a waste of a gustatory opportunity! Where was I? Sorry, I fade into a culinary stupor just thinking about Piemontese food! 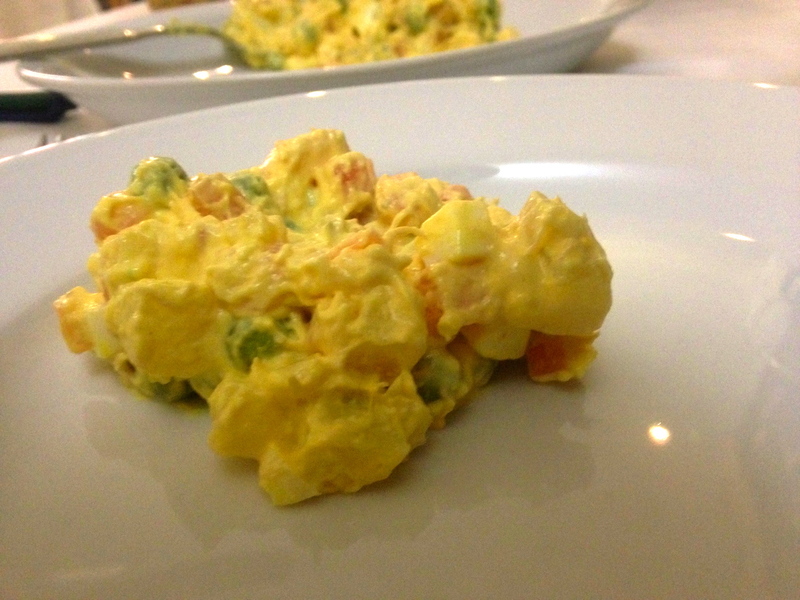 First up was Insalata Russa, or Russian Salad. I wonder if the Russians call it Italian Salad when served in Moscow. It is to Piemonte (and the rest of Italy) what potato salad is to a Texas barbecue. Actually, it’s an Italian version of potato salad, with lots of extras like eggs, pickles, carrots, capers, peas and even tuna thrown in. Everyone has their own recipe, just like potato salad. Quite honestly, it’s a meal in itself. Grissini, Insalata Russa and a glass of Dolcetto. Nope. There’s more. Maurilio came in, as usual in a bit of a hurry, and greeted me warmly as he had on so many previous occasions. He was moving and had planned on taking the day off given it was quiet. But here he was and it wasn’t long before he was lending a hand. First, he poured me a glass of the house Dolcetto. Forgive me, I forgot to get the name of it, but it was lovely. I spooned a bit of the Insalata Russa on my plate, savored it – yup, delicious as always – and then began snapping photos of it. Italians have a God-given talent of transforming simple, pedestrian ingredients into delicious taste sensations. My server brought the next dish. Thinking I was finished, she picked up the small gratin plate still filled with the golden concoction. I grew up in a household with three older brothers and had learned at a tender age to stop someone from taking my food. And I did. It wasn’t greed; it would have been insane not to have just a wee bit more! I’ve never had the same antipasti choices twice. Sometimes it includes carne cruda – another dish for another post – and sometimes sweet bell peppers stuffed with tuna and capers. But always the Insalata Russa, Vitello Tonnato and, Chef Paolo’s sought-after chicken liver pate with sweet onion relish and brioche. That was next. This time the 2″ size ball of liver pate had a slice of terrine with pistachio nuts as a sidekick on the plate. This was not a time to be counting calories or fat grams. And certainly I didn’t want to hurt Maurilio’s feelings, so I ate is all. Just remember, it’s all from scratch and no preservatives! Vitello tonnato is a dish that screams “Piemonte!” Chef Nick Haley of Zino Ristorante in Edwards, CO studied at the prestigious Italian Culinary Institute for Foreigners in Costigliole d’Asti and is a huge fan of this simple dish of veal rump – usually poached or braised – and tuna sauce. But he marvels at how Americans are so turned off at the thought of combination of veal and tuna. What a pity because he would like to serve it more often in his restaurant. When properly prepared and yellowfin tuna in olive oil is used, it’s a marvelous dish. Like every other dish you’ll find in Italy, everyone has their own variations of the creamy sauce. Chef Paolo’s preparation of chilled paper-thin slices of rare veal with a dollop of sauce is never anything less than delicious. Vitello tonnato makes an excellent summer main course and holiday celebration antipasto. It’s also a popular dish in Argentina, no doubt brought there by Piemontese immigrants similar to Papa Francesco’s ancestors. 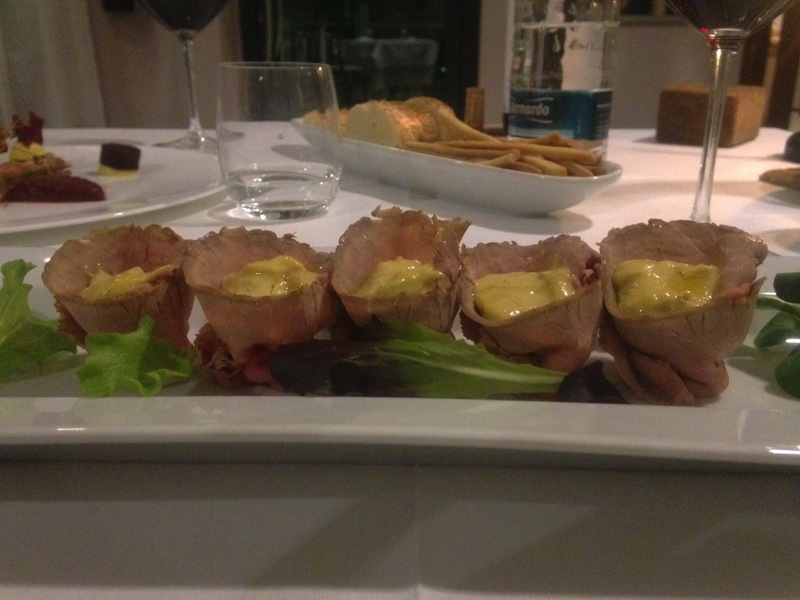 Not sure why, perhaps I was protecting my plate, but I didn’t get a picture of the vitello tonnato at La Cantinetta. So here’s a snapshot of one I had at Profumo di Vino in Treiso with winemaker Renato Vacca of Cantina del Pino earlier in the week. Still not finished. And don’t forget, this is “merely” the antipasti. 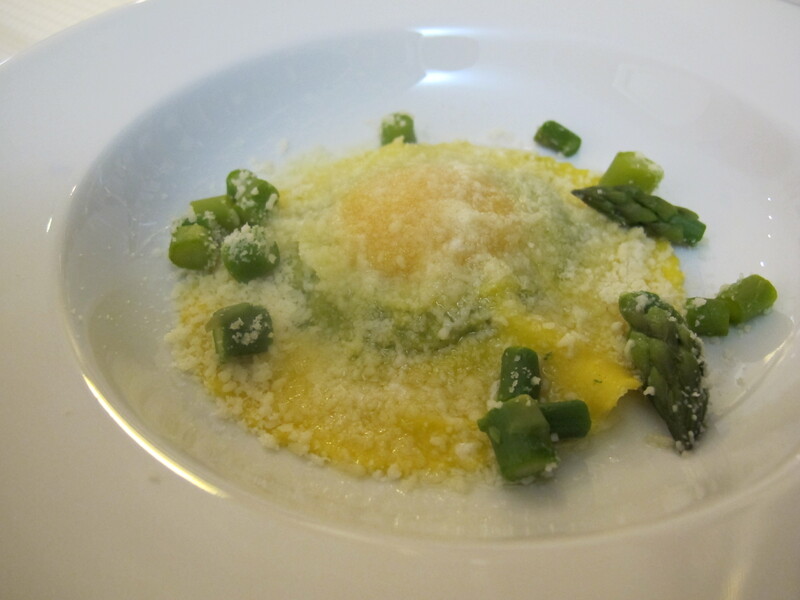 Although made with pasta, Chef Paolo’s tender raviolo is a popular item amongst the antipasti choices. 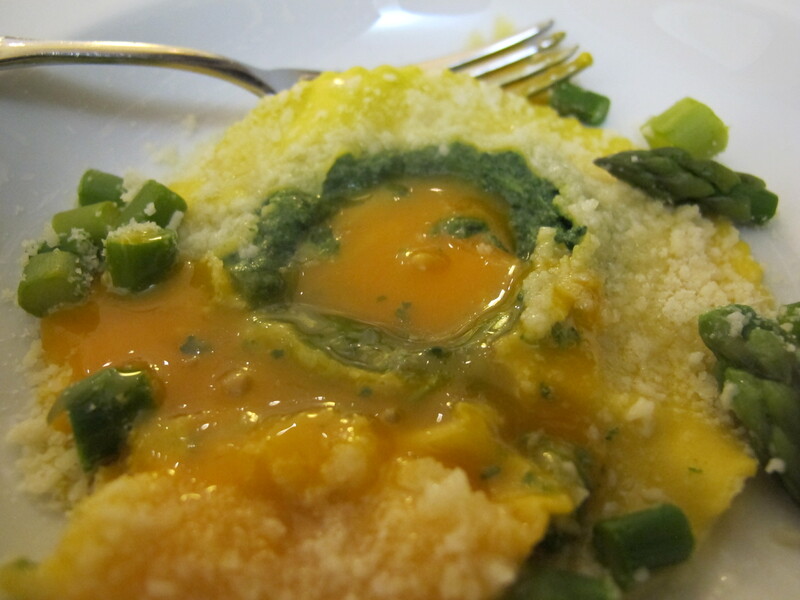 The presentation changes a bit with the seasons, but it always stuffed with a deep golden, runny egg yolk and pureed spinach and topped with grated Parmigiani-Reggiano. In keeping with the season – despite what the weather was saying – tender green, pencil-thin asparagus were cut and sprinkled on top. Any one of the preceding dishes would have qualified as a meal, not merely something “before the meal.” But there was more to come. 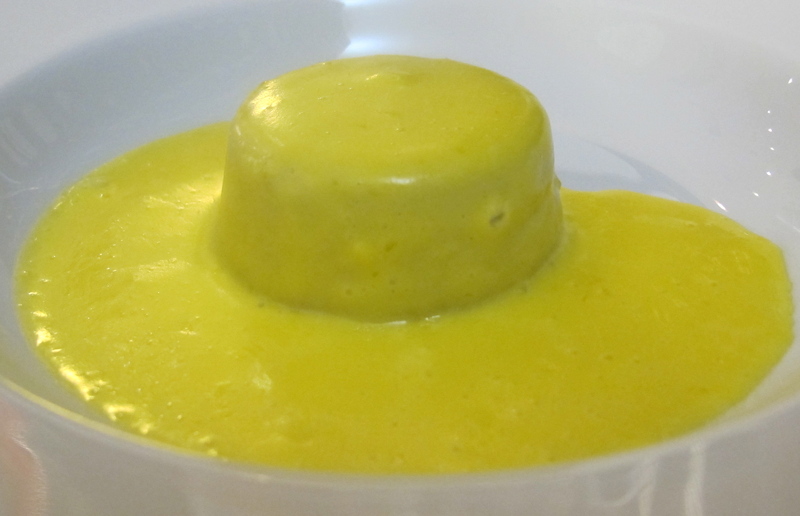 The cardi (thistle) flan with fonduta is another Piemontese specialty. Although slightly bitter, the flavorful vegetable flan is a perfect companion to the creamy sauce made from fontina cheese, egg yolks – and theirs are such a deep golden color! – and milk. Maurilio was adamant in telling me no flour is used in their fonduta as it gives the sauce a slight grainy texture with a taste of flour. This was nothing short of sublime decadence and a great ending to my meal although Maurilio was trying to convince me to have some pasta. Willpower prevailed, helped along by the knowledge I was going to have a lovely four-course dinner back at Agriturismo Il Bricco that evening! And I didn’t even have a second glass of Dolcetto knowing how strict the drink driving laws are now. Finally, without the distraction of food, I had Maurilio all to myself for an interview, except for the occasional break to say “Grazie” and “Ciao” to departing guests. We spent an hour talking and you’ll have to wait until my Vail Daily article on that, but it was the discussion of my book project that finally turned the conversation onto the path of the serendipitous discovery of Chiara Boschis. In my journal, I simply wrote “Chiara Boschis, owner E. Pira e Figli.” Her family’s name was of course familiar, but this women who was one of the first of her gender to run a winery in Barolo was new to me. Maurilio said “I’ll take you to meet her.” So into the misty rain we went up the street and across the main road that skirts town to the winery on the corner. Beside the thick, imposing wooden door was a plaque that read simply, “Pira.” The loud bell brought to the door a smiling man I later discovered was Chiara’s younger brother, Giorgio, who has been with her in the winery since 2010. Chiara was away, but he gave me her card. I would have to wait, perhaps until June, to meet her. Then again, not. The coming week would bring me back to Barolo to finally have an opportunity to interview this incredibly passionate, poetic winemaker who just so happened to be a woman. 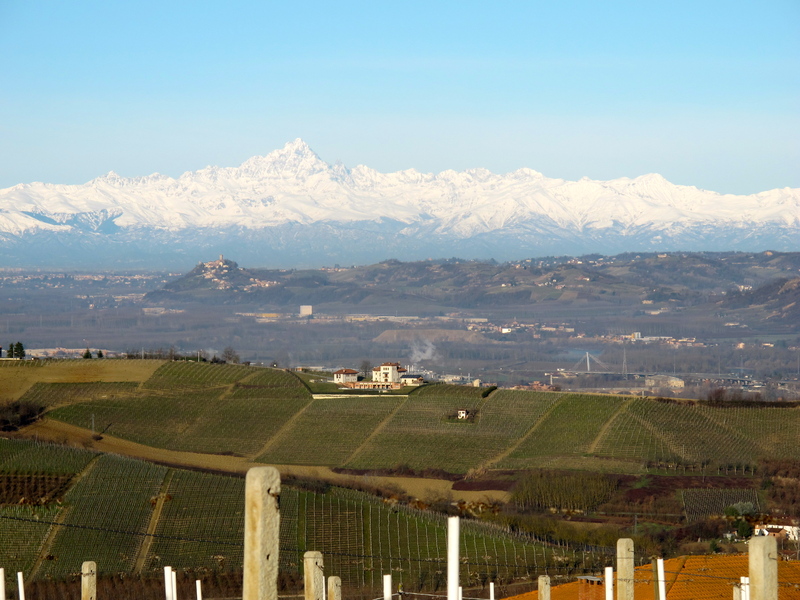 One of le donne di Piemonte. Wine is an expression of culture made by man, not just by nature. Wine families are the ultimate vinous artisans. Would love to have you follow along to meet wine families around the world. Enter your email address to subscribe to this blog and receive notifications of new posts by email. Wines Do Not Live By Scores Alone!